Coffee! The addictive drink that gets us out of bed in the morning, the reason we feel we can function, the fluid that replaces blood in a lot of our bodies. The caffeine addiction worldwide is real, and more and more small boutique coffee plantations in South Africa are producing small batch, quality beans for our indulgent consumption. Coffee is inherently an African crop, it’s humble roots originating in Ethiopia, and spreading worldwide through trade. Brazil, Vietnam and Columbian production exceeds that of African trade, despite the fact that coffee production locally is an important source of income throughout Malawi, Ethiopia, Zambia, the Ivory Coast and Kenya. The deliciously fragrant and pungent Arabica bean found it’s origins in the high mountainous regions of Mount Kenya, whilst the Ivory Coast boasts the Yirgacheffe, Harar Arabica and Sidamo varieties of bean. Robusta is the stepchild of the coffee family- the less favoured variety. The less punchy bean originates in the forested areas of Liberia, Tanzania and northern Angola. Robusta is used primarily in instant-coffee production- it is more resilient and has a longer shelf life. Why plant my own coffee? The reward of growing and harvesting your own coffee will be tangible when you are able to pick your own fruit, husk your own beans and roast your own brew, ready to grind into aromatic, fresh, strong coffee. Be warned, this is a long term project with many steps, but we encourage you to be take the leap into home coffee bean extraordinaire! How do I prepare my soil to plant coffee? Coffee plants need deep sandy loam to grow well. The soil needs to be well draining, so if your soil is too clay-like, it won’t work well. Add river sand, perlite, vermiculite or gravel basalt to clay soil to increase its aeration and make it lighter and more well draining. Sandy soil will need plenty of compost and nutrients added to it to increase nutrient content. Coffee plants love nitrogen rich soil and are heavy feeders, as they are evergreen lush leafy green plants. 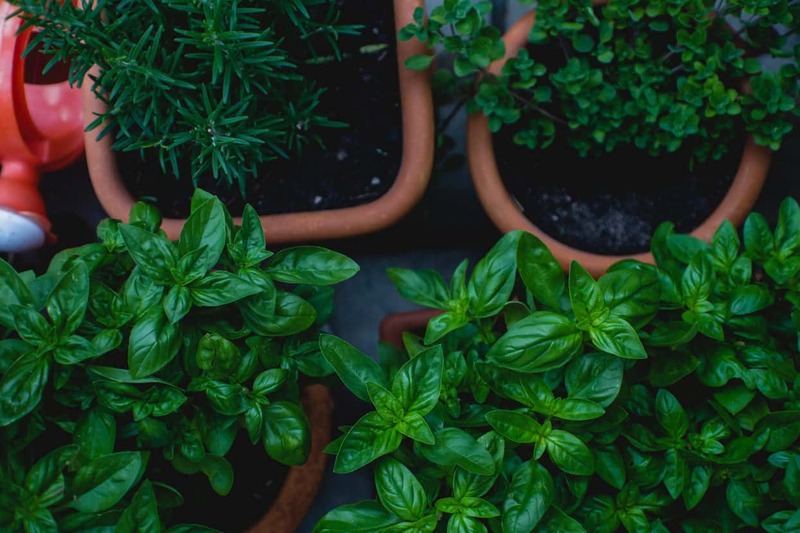 Acidic soil can be achieved by adding freshly ground coffee grinds, (used ones from your filter are pH neutral and will not affect pH in your soil), or any fertilizer with ammonium nitrate or ammonium sulfate. Ammonia is a good additive, and to clay-like soils, adding iron sulphate is an excellent idea. Ask any of our friendly floor staff to help you find the correct additives and soils to make your soil completely coffee-plant compatible! To sow, place between wet coffee sacks and water them twice a day. Ensure these sacks do not pool water, they must drain well. Alternatively, well draining vermiculite or sand can be used as a germinating medium. The very finicky seeds have a 1 in 3 germination success rate, so plant a few more seeds in preparation. In moderate temperatures of mid 20’s, they still take between one and six months to germinate. Once they have germinated the seeds can be transplanted to a light loam soil which has been fortified with rotted manure and plenty of bonemeal. Place light compost over the top and do not compress. Water very lightly on a daily basis, allowing the tiny seeds to become moist, not wet. When true leaves appear, the seeds are ready to be transplanted. At this stage ensure soil is low pH and high in nitrogen. You may find it easier to find a coffee plant than to find seeds. We recommend buying a coffee plant, which you can find at Lifestyle Home Garden in a 5 Litre bags for R199.99. Under which conditions will my coffee plant thrive? The coffee that we know, love, and consume on the daily is grown in tropical conditions, with plenty of humidity and warmth, usually at high altitude. It is difficult to replicate these conditions when we live in differing climates. 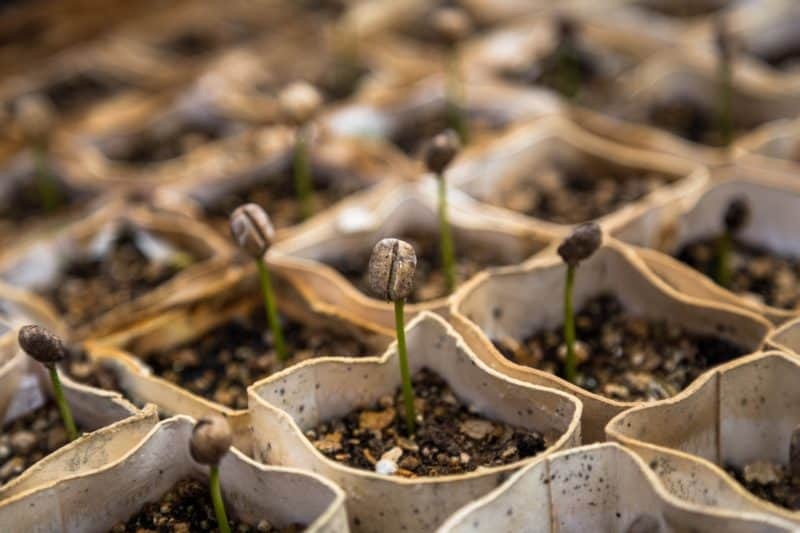 For coffee plants to be successful and to encourage fruiting, watering should be reduced just as winter is setting in, with a surge of watering taking place as Spring arrives. This shocks the plant into bearing blooms. Young transplanted seedlings and young plants will need a sheltered spot with morning sun. Keep soil at the correct pH levels and keep soil moist but not waterlogged. An even better option is to keep the coffee plant indoors. Filtered daylight and regulated temperatures benefit the plant, which the grim reaper of the plant world will come to collect if the evenings reach even one degree chillier than the coffee plant desires! Ideal temperatures for the coffee plant is between 12 degrees Celsius and 25 degrees Celsius. Direct sun can result in leaf burn and afternoon heat outdoors will see the plant perish, especially in hotter months. This is all the more reason to find a cosy warm indoor spot near a window for your plant, or a spot with afternoon shade if it lives outdoors. Misting your coffee plant with a fine spray of water helps to create the humid environment that coffee naturally thrives in. Coffee cherries may take anywhere between 3 and 8 years to appear on your plant. This is arguably the chief reason to buy an established plant, over seed. Your waiting time from seed to cup is far longer when you decide to plant from seed. Once cherries appear on your coffee plant, hand pick the fruits. The berries will range in colour from yellow to red, depending on your climate. There are two methods to process coffee- wet and dry. Seeds are laid in the sun to dry. The husks and skins are removed with a special machine. This method produces a coffee with a strong sharp flavour, and is suited to drier regions. Cherries are soaked in water. The next step is to squeeze the cherries so that the beans are separated from the pulp. Soak the beans in a bucket to further loosen the flesh of the fruit. The beans will sink to the bottom of the bucket. Bad seeds will float, and together with the flesh they should be composted or discarded. Next- dry the beans on a mesh grid or warm concrete spot in the sun for between 10 to 30 days. The beans need to be moved around and rotated a few times a day to ensure even drying. When the skins become flaky, the beans are dry enough. Roasted in a coffee roasting machine. Fresh coffee grinds that have not been through a coffee machine of any sort add a valuable layer to compost and garden beds, and are a low pH, aka they are acidic. Coffee grinds that have been heated and used in the process of making coffee are pH neutral. Coffee cherries usually produce two coffee beans, which are in fact seeds, and not true beans at all. When a cherry only produces one seed, this is called a Peaberry. These are oftentimes discarded, or removed from the yield to sell separately. Arabica comprises roughly 70% of the worlds coffee production, whilst Robusta, or Canephora, makes up 30% of coffee trade production. Robusta is cross pollinating, Arabica is self pollinating. 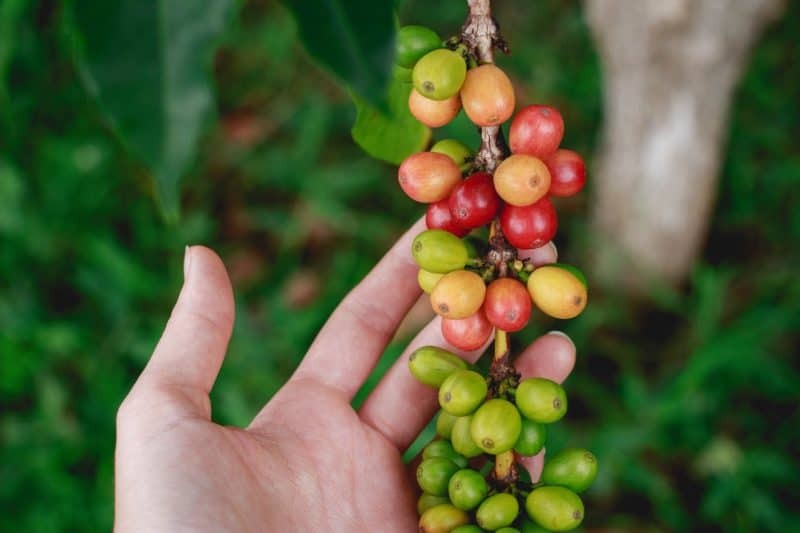 This means that your Arabica plant will produce cherries with just one plant, whereas the Robusta variety will need two or more plants to produce fruit. 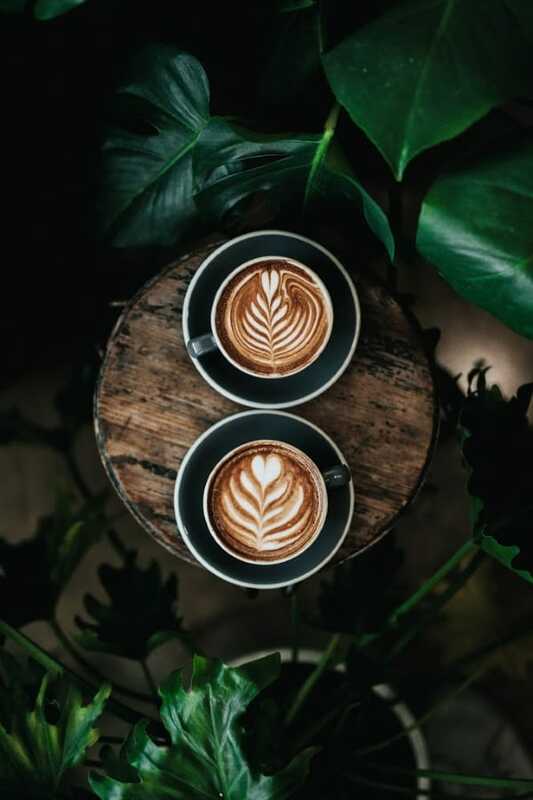 If you are prepared to devote the time and patience to growing your own coffee, there will be a caffeinated and delicious reward awaiting you at the end.